Teeling Whiskey saw a 22% rise in turnover to €14.8m between 2016 and 2017, the company's latest financial results show. However, operating profit is down with Teeling investing in expansion as it plans to sell its own whiskey for the first time. 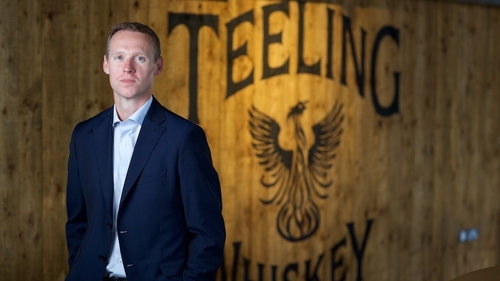 The founder and managing director of Teeling Whiskey Jack Teeling said 2018 is a "key year" for Teeling as its own Dublin-distilled whiskey comes of age. It takes three years and a day for whiskey to mature and to be legally sold as Irish whiskey and Mr Teeling says the company has been "laying the foundations over the past 18 months to take advantage of that". On the investment to get to where the company is now, Mr Teeling said: "We've invested over €30m in terms of building our distillery and laying down inventory and what we've been doing over the past 18 months is building the team and investing in advertising and promotion to ensure that we're well positioned to take advantage of the opportunities." He said that the whiskey market in Ireland has exploded in recent years - going from four to 20 distilleries with at least another 26 planned. The Teeling head said "it's not an overnight success. Irish whiskey has been the fastest-growing spirits category for over 20 years but what's actually happening now is the market is segmenting - it's premiumalising, people are looking for something different. "The growth has been by a handful of very large brands which we are all aware of but people around the world are now asking questions and trying to discover something different." The US accounted for over 4 million cases of Irish whiskey exports last year, representing an annual rise of 12% for that country. On the main export markets for Irish whiskey, Mr Teeling said: "The US is really where it has been for the last ten years and will continue to be for the foreseeable future." He added: "You have to make it there if you're going to be a credible international Irish whiskey brand and, hence, why we have ten people on the ground (in the US) trying to help us build our brand. Here, overall Irish whiskey sales rose by just over 5% last year, but premium sales jumped by 40%. The Teeling MD said the company is focusing on people "drinking less but drinking better and I think that's being reflected in the trends". "The newer generation of Irish whiskey drinkers domestically are looking at those kind of consumption patterns and I think that trend is going to continue." Teeling hopes to double its sales over the next three years that "would get us up to around €30m", according to Mr Teeling.